This trekking route passed many gigantic mountain ranges – Annapurna , Dhaulagiri and Kanjiroba, to name but a few – and passed through Lower Dolpo , at one time a small kingdom in its own right. The trekkers of this regions are enthused greatly about the wild remoteness, the stunning mountain scenery and the fact that the local people had that innocent friendliness peculiar to people who live in excessively remote mountainous regions. The people that live here number only a few hundred and are among the world’s highest dwellers. The villages in Upper Dolpo are 4,300meters and above. It is here specifically that people still practice the pre-Buddhist Bon Po religion. This early sect was almost entirely replaced after Buddhist doctrine began to spread across Tibet in the 9th century. Peter Matthiessen’s “The Snow Leopard” and David Snellgrove’s “Himalayan Pilgrimage” have contributed to the mystique and attraction of Dolpo. Both writers visited the Shey Gompa, to the north of the Phoksumdo Lake, inner Dolpo. This is the goal of most trekkers but this Dolpo trek will take you even further into this mysterious land. Day 1 Day 01: Arrival in Kathmandu airport (1345meters). Our airport representative will be receiving you at Tribhuvan International airport, Kathmandu and s/he will be displaying an Ace the Himalaya signboard outside the airport terminal. You will be then transffered to your respective hotel in our private tourist vehicle. Overnight at Hotel. Day 2 Day 02: Pre-trip Meeting and Sightseeing around Kathmandu valley. In the morning, after breakfast, At around 8am, we host a pre-trip meeting at your hotel in Kathmandu and introduce your trek leader/guide. Please seek this opportunity to ask questions about your trek. We will also supply you with our trek Duffel Bag, T-shirt and a Cap. For the meeting, please make sure you bring passport, three copies of passport-size photos, and a readable copy of your travel insurance policy. During this meeting, please clear the due balance, if any, and sign the legally binding trip form as well as the non-liability disclaimer. Please inform us in advance if you will be arriving late and therefore are unable to attend the pre-trip meeting. After the meeting and a hearty breakfast, your sightseeing trip will start at around 9:45am. You will have a private vehicle and a professional tour guide at your disposal. We visit Boudhanath Stupa, one of the biggest Buddhist shrines in the world, where we observe Buddhist monks praying in the monasteries surrounding the stupa. After Boudhanath Stupa we visit Pashupatinath, the most famous Hindu temple in the country, located on the banks of the holy Bagmati River. Here we see Hindu holy men (sadhus) meditating, pilgrims bathing and occasionally funeral pyres burning on the ghats. We will also visit Bhaktapur Durbar Square, which is a collection of pagoda and shikhara – style temples grouped around a fifty-five-window palace of brick and wood. The attraction of the Bhaktapur Durbar Square is The Lion gate, The Golden gate, The Palace of fifty five windows, Art Galleries, The Statue of King Bhupatindra Malla. The rest of our time in Kathmandu is free for further exploration and some last-minute shopping in Thamel area near by your hotel. Overnight at a hotel. Day 3 Day 03: Fly to Nepalganj from Kathmandu- 1 hr Flight. The flight to Nepalgunj will give you good views of the Himalaya towards the North. Upon arrival, you will be transferred to your hotel. There will be time in the evening to have a good look around the town, which is 3 kms from the Nepal-India border. Overnight at a hotel. From Nepalgunj we take a flight to Juphal, it is about 35 minutes flight. Twin Otter is the primary mode of transport to from the airstrip of Nepalgunj to Juphal and Juphal to Nepalgunj. This service is fairly dependable. Sometimes, flights may be cancelled due to weather conditions or other technical problems. After landing in Juphal we will meet the trekking crew, do equipment packing and walk through terraced fields to the Bheri River and the narrow canyon which after 3 hours will lead you to a relatively larger village called Dunai. Overnight at tented camps. From Dunai you cross the new suspension bridge and turn west, following the trail past the new hospital. At the confluence of the Thuri Bheri and Suli Gad rivers you turn to the north and follow the Suli Gad. The trail is fairly undulating but mostly up while the going is firm underfoot. You are never far from the river and can always hear its roar. You pass through an area which is overgrown with marihuana plants but also has crops for the villagers and animals including millet, pumpkin, potatoes, sweet corn and chillies. Many of the villages in this area are involved in the production of a lotus-like plant called ‘chuk’ that is used to make vinegar and medicines. You continue to track the river and eventually reach the settlement of Hanke, which is also the entrance to the Phoksundo National Park. The three villages you pass through have a strange name connection: Parela, meaning eyelash, Rahagaon meaning eyebrow, and Ankhe meaning eye. Overnight at tented camps. The trail starts becoming very hectic but once you cross the river twice on well made bridges, you then make a steep ascent on a very narrow path, hugging the cliff face. Having descended to the river again the trail takes another steep ascent requiring frequent stops to watch the panorama of the landscapes and also for rest. You may camp on the side of Suligad River. Overnight at tented camps. From here the initial hours of the trek is fairly easy. But from Sumdo the trail becomes very much like an incline. Here the river is left behind and you follow the path high above the water. Climb up to a ridge, about 3,875m, from where you will have the most staggering views of a 300m waterfall, the highest in Nepal, and your first view of Phoksundo Lake. You then descend through birch forests to the upper reaches of the Phoksundo Khola and on to the picturesque settlement of Ringmo with its mud plastered chortens and mani walls. The village now has solar panels helping to improve the quality of life of the villagers. From the settlement it is a short walk to the shores of Phoksundo Lake where you set up the campsite. Overnight at tented camps. You follow the trail that skirts the edge of the lake itself. This precarious trail is suspended on a gangway of wood supported on pegs, driven into crevices in the rocks and signals the remoteness of the area you are about to enter. You go very steeply up, to 4,040m, and then plunge down again to the valley bottom to enter the flood plain of the Phoksundo Khola and trek to your night stop alongside the river, within the confines of the forest to avoid the worst of the wind which is prevalent in the valley bottom. Overnight at tented camps. Today you should take sandals or footwear suitable for Knee deep as you are crossings a few streams. This morning you continue along the level path through a glacial valley that now heads north. As this becomes narrower and narrower there are impressive vertical cliffs and contorted rock formations. At the confluence of the Phoksundo Khola and another, unnamed, mountain stream there is an old wooden bridge. Here you take the barely discernible path to the north east up a side valley which has a cavernous look. There is no trail as such, so it is necessary to clamber over rocks and boulders and to ford a stream that rushes down the steep valley. A long climb brings you to a sheep meadow where the trail veers up a steep ravine. A hard climb to the top brings you to yet another valley where you can see the Kang La, the pass will lead you to Shey Gompa. You camp just before the pass in a place that Peter Matthiessen christened ‘Snowfields Camp’. Overnight at tented camps. The somewhat indistinct track is physically demanding, especially on the loose slate screed. It will take about 2.5 to 3 hours to reach the top of the Kang La. The views from the top are magnificent and well worth all the hard work. The height of the Kang La is variously given between 5,200m and 5,500m depending on the map one uses. On descending steeply to the valley floor, not more than 45 minutes, you make a long meandering trek along the banks of the river, crossing it once. A red chorten heralds your arrival at Shey Gompa where a quaint wooden log bridge leads up to the Shey compound. Overnight at tented camps. It was the first Kagyupa monastery and its founder was the lama Ten-szin-Ra-Pa. The monastery was built during the 11th century. Shey is famous for its ancient Buddhist culture. In Dolpo the ancient Tibetan way of life combines animism with the teachings of Buddha. Drutup Yeshe introduced Buddhism in the Dolpo valley. Many years ago he came to Dolpo and came across wild people, whose supreme God was a ‘fierce mountain spirit’. Crystal Mountain is to the west of Shey monastery. It is a very strange mountain indeed. Its contorted cliffs are laced with quartz and embedded with a rich variety of marine fossils. Shey Gompa stands above the confluence of Kangjunala and Yeju nala. Near the confluence there is a group of prayer mills turned by water wheels. Overnight at tented camps. Today, you start by following a pleasant track amidst juniper, which ascends to a grey, stony canyon. This begins to zig-zag over bare rocks and coarse eroded soil until it eventually brings you to a flat spot, suitable for a brew or lunch, if the weather is fine. Then continuing very steeply up for 20 minutes before traversing to the top of the Saldang La pass. Here you will enjoy great views towards the arid landscapes of Mustang and the distant snow peaks of Tibet. The subsequent descent towards the north is long and tiring, but you finally come upon the welcome sight of pastures of grazing yaks and sheep and nomadic tents made from yak hair. This signals your approach to Namduna Gaon. Like Shey, the Namgung monastery is of the Karma-pa sect. The monastery, a red stone structure, is built against the backdrop of a cliff on the north wall of a gorge. The red and white colors of the Gompa and its Stupas are the only color in this stark landscape. The village itself consists of only six stone houses and has terraced fields on both sides of the tributary, which flows down to the Nam Khong valley. The economy of the region is based on agriculture, animal husbandry and trading. In Dolpo only one crop a year can be grown and this is mainly barley. In some village buckwheat, oilseed, potato and radish are also cultivated. Recently the main cliff temple collapsed and the villagers have now built a beautiful new monastery in the village itself. Overnight at tented camp. Leaving Namgung monastery and start climbing. Further on it begins a long thrilling traverse along some dusty barren mountains. Looking down into the valley bottom it is very evident that the people have made best use of the fertile valley as one sees the neat terraced fields showing bright patches of green and ripening crops. You ascend before going down steep slopes to the picturesque village of Salding, situated on a plateau high above the Nam Khong nala and the biggest village of the inner Dolpo area. Though the village lies at about the same altitude as Ringmo, it is totally different. Ringmo, a Himalayan village is situated below the tree line while Saldang belongs to the arid zone of the trans-Himalayan Tibetan plateau. The village stretches for two kilometers on an open slope and consists of five villages having eighty well-built houses with nearly six hundred villagers. It is prosperous, not only agriculturally, but also for its strategic location on a trade route to Tibet. Overnight at tented camps. After leaving Saldang on the way down to the river bed you pass through terraced fields, Stupas, Chortens, heaps of Mani stones and a Chaiba monastery. Namdo, the next village is also prosperous with sixty houses having nearly four hundred inhabitants. It stretches for more than 5 kms on the high slopes to the left of Nam Khong Khola. The Namdo monastery is located near the river bed. There is also another monastery on top of a high cliff. You camp near the small Settlement of Sibu, right on the river bank. Overnight at tented camps. Following the line of the river valley the trail is fairly easy going initially. After about two hours it is necessary to wade another stream before turning into a side valley and the rise becomes very sharp. This is a pleasant meadow, but bestrewn with rocks, yak and other animal droppings. Overnight at tented camps. The trail is generally well compacted making the going underfoot easy, much easier than loose shale, but it is steep. It is only a 2 hour climb to reach the top of the Jeng La. From the top of the pass there are good views of the Dhaulagiri massif, glittering in the morning light. A rough track descends towards the Tarap valley. By the afternoon you find a green valley which leads you by a pleasant track down towards the Tarap Chu. Tarap is a dream valley with vast plains in high mountains extending 20kms along the river Tarap Chu. It has ten villages with cultivated fields, many Gompas and Chortens of both sects. You halt for the night at Tokyu monastery. This monastery also belongs to the Chaiba sect. Overnight at tented camps. Before leaving Tokyu a short visit can be made to the Chaiba Gompa. The trail is broad and well traveled, making the going easy and there is evidence of work in the fields, where the women will be bringing in the harvest – the men are away bringing down the herds of animals for the forthcoming winter. There are many Mani walls but some of the Chortens are in a bad state of repair. The ‘ French School ‘ is just outside the village of Dho Tarap where you have your night stop. Tarap is inhabited mostly by Magars who have lived here for generations but also by a few Tibetans. They wear home-spun clothing that is sometimes dyed maroon and they favor Tibetan style Somba (boots with upturned toes) for footgear. Men and women often wear both religious amulets and strings of coral and turquoise. The inhabitants of this village are both Bon Po and Buddhist (Nyingmapa). In the afternoon a walk up to the Buddhist Gompa is very worthwhile. There is a resident lama who is very happy to show off his monastery and might even let you see his private Gompa and the Tankas he has made himself. 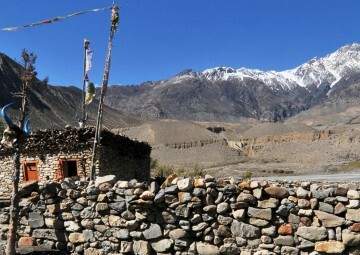 The Bon Gompa is about half an hour’s walk from camp. Overnight at tented campss. Your route follows the course of the Tarap Khola, generally downhill. You go through narrow gorges with the river rushing through. One may see blue sheep, marmots, yaks, sheep, and goats and perhaps meet people from Dolpo taking their flocks of sheep and goats to lower pastures for the winter. The afternoon brings more undulations in the path when it leaves the immediate course of the river. There is evidence of improvements to the trail where parts of the rock have been blasted out. You will also see the first of the modern steel suspension bridges which have been built to facilitate movement of people and animals. The track is very narrow in places. You reach your overnight camp on a grassy strip by the river. Overnight at tented camps. You continue to walk down the gorge of the Tarap River, at times alongside it and at others high above, on a narrow trail built out from the steep slopes. The quality of the path varies from broad, smooth and firm to very narrow and crumbly. There are also flights of manmade stone staircases which need to be tackled with care – some of the constituent rocks wobble when stepped upon! An exciting day in deep and awe-inspiring gorges. Your camp site is a pleasant meadow in the shade of a stand of trees. Overnight at tented camps. Coming into the broad fertile valley of the Barbung Chu, you walk amongst the various crops of millet, sweet corn, barley, buckwheat, green beans, chilies and marijuana. Your lunch and night stop is high above the river but there is a standpipe for water. Tarakot is an old fortress town known by the local people as Dzong, meaning ‘fort’. Before the Gorkha dynasty Tarakot was the capital and had a dzong. The famous Sandul Gompa, which lies 8km east of Tarakot and at the junction of Barbung Khola and Tarap Chu, stands on a knoll to the south of Bheri river and at one time supervised collections of tolls for the trading caravans traversing an area called Tichu Rong. Overnight at tented camps. The trail is mostly down and fairly firm. Walking beside the Bheri river, you use the ingenious path built twenty feet above the river. All too soon you have reached the village of Dunai and the camp site you used before. You will now have completed the circuit of mysterious land Dolpo and a celebration party is sure to happen. Overnight at tented camps. You now retrace your steps to Juphal. Initially the way is flat but the final hour up to your destination seems steeper than you remember on Day One! Overnight at tented camps. Early morning flight to Nepalgunj from Juphal. This is a wonderful 35-minute flight over the Himalayan foothills, with fine views of giant peaks including Annapurna and Dhaulagiri to the north. You then connect with the flight back to Kathmandu. Overnight at a hotel in Kathmandu. It’s also spare day in case the flight to Kathmandu is delayed. You have the option to extend your trip to continue onto Chitwan jungle safari, rafting adventure, Kathmandu valley shopping tour, scenic Everest flight, mountain biking and other activities. In the evening we will have a farewell dinner in a traditional Nepalese restaurant with cultural performances. (Your guide(s) and an office staff will accompany you.) Overnight at a hotel in Kathmandu.